From breakfast to bedtime, we are creatures of habit. For those of us with a more settled lifestyle, our schedules remain consistent from day to day for weeks on end. Chances are, though, your routine has taken shape without much forethought — or at least without the kind of scientific insight that can help to maximize energy levels, productivity and happiness. 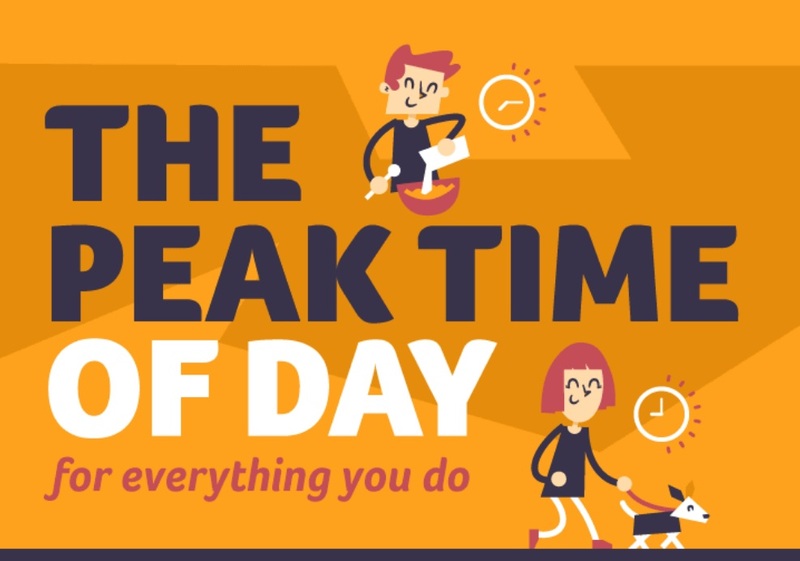 If this is the case, it could be time to rewrite that schedule with more attention to how the time of day affects your body, your colleagues’ moods – and even the outlook for your dog. If you like to ease yourself into the day, your new regime may take a bit of work. Exercising before breakfast has been shown to help with weight loss — and that doesn’t mean you can shove breakfast back to 11am! No, breakfast is a dish best served within an hour of waking if you want to kick-start your metabolism. If that’s all a bit of a shock to the system, you may want to check in on Twitter before you leave for work. Studies have shown that’s when the happiest tweets hit the press — a perfect post-workout pick-me-up. Here’s the good news: once you’re at work, putting off your morning break until later, out of some sense of martyrdom or test of will, is not necessarily best for you. In fact, it’s been proven better to recharge yourself before you burn out – say, 10:30 in the morning. That should give you a little longer to work up the nerve to ask for a raise. Experts (presumably highly-paid ones) recommend 5pm as the optimum time to catch your boss in a good mood. You’ll sleep well with that in the bag — but even better if you pick a bedtime that falls on a ninety-minute interval from your reveille. If you wake up at 7, for example, 10pm or 11.30pm will line up nicely with your sleep cycle and leave you refreshed to do it all again tomorrow. For more on these, and a host of other timely tips, be sure to check out this infographic from Netcredit on the optimum times to complete a range of tasks. Perhaps read it around 10pm when, physiologists suggest, your brain is likely to retain information for longer.